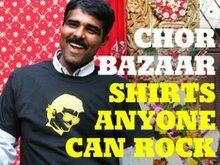 CHOR BAZAAR WORKSHOP: India wins the Twenty20 World Cup! India wins the Twenty20 World Cup! Mahendra Singh Dhoni's young Team India snatched the inaugural Twenty20 world title after defeating arch-rivals Pakistan by five runs in a rousing final on Monday. For those that don't know, that is a tiny margin for cricket. At least none of India's Players will lose their homes to disgruntled cricket fans. That much cannot be said for the Pakistan players. Fans will literally burn down their team's player's homes due to a loss like this one. Forget the other sports rivals of the world. India and Pakistan, takes it's cricket to a fanatical level. It's an unspoken right to take the day off and watch cricket, and if they win something like the T/20 World Cup, your excused for coming in late and hung over. Places like the Paan Gallas are packed with crowds stumbling over each other to catch a glimpse of the match around a black and white television. What is normally chaos on city streets is reduced to Sunday morning traffic. 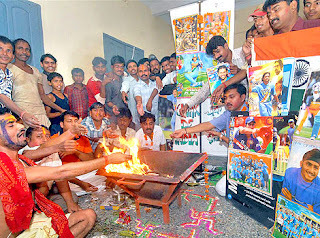 Fanatical, Cricket lovers and fans perform Hawan in Patna for India's win in the Twenty20 final match against Pakistan, on Monday, September 24, 2007. Superstitions run high and fans perform strange acts in hopes of a win. Congratulations India! This was huge for India and Pakistan to be in the finals. On another note, India needs a bit of help with their uniforms. Common, they must realize that they are nasty? This is like everywhere else in the world. People are no different when it comes to sports and they express it in their local ways - prayer, song, dance, celebration and occasionally violence!